In the search for alternative sources for energy in America, wind power seems to be a no-brainer... prices are competitive, many parts of the country have abundant wind resources, wind farms are infinitely scalable in size and variable in configuration. Yet, wind farms are voted down in many communities, largely for NIMBY-based aesthetic reasons(*)(**). To fight against that sentiment, the wind power industry recently created a website called reimaginations.com that offers fine art prints of art inspired by or featuring windfarms. 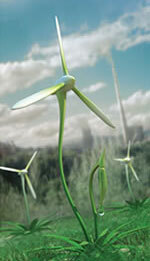 (*)Personally, I think that a wind-farm can give a lovely futuristic sci-fi look to a landscape. But then, I've also been known to admire a particularly complex arrangement of drainage pipes. (**)Philosopher Justin Good examined the interaction between of aesthetic view of technology and the aesthetic view of nature in a recent post on Design Observer.